The Coolidges, hosted by Clarence Barron (third person to Grace’s right with the white beard), as they pause to go into St. Stephen’s Church in Cohasset. American track runner and Olympic bronze winner Joie Raye (L of Coolidge) and Paavo Nurmi of Finland (R), who would win his ninth gold medal at the Olympics in 1928 in long distance running. 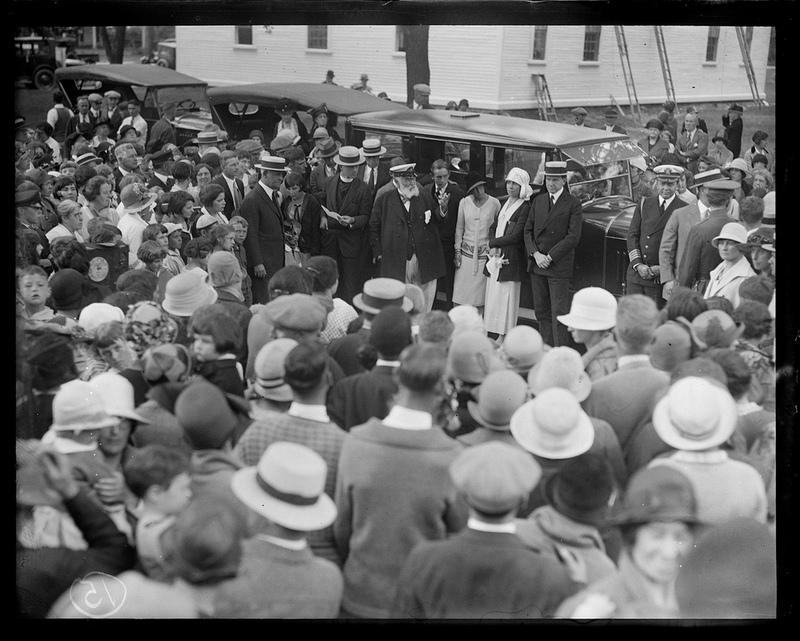 Raye and Nurmi (the “Flying Finn”) visited President Coolidge at the White House on February 21, 1925. The policy during the Coolidge years, frequently criticized as inhumane and heartless misses the substance of what Coolidge himself states on this issue. It was a consideration for everyone that convinced him restriction best preserved the blessings of being in America for everyone. 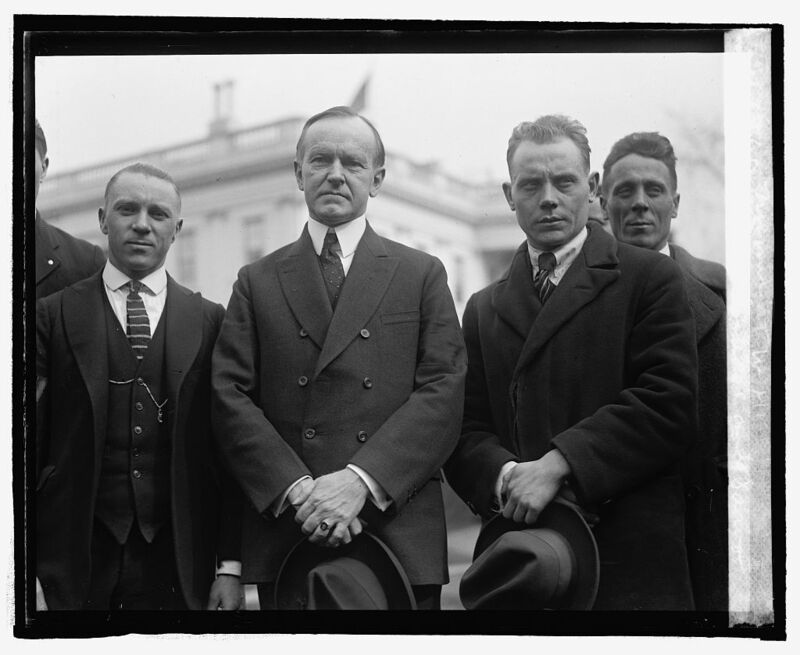 Race, color, ethnicity held no sway with Coolidge. Instead, what mattered was the most colorblind framework for the cooperation and cohesiveness of society — the economic opportunity only possible within capitalism. It was free market economics that persuaded Coolidge and not merely a reckless pursuit of cheap labor but rather men and women who came here not to take America’s blessings without also embracing its obligations, foremost of which is the obedience of law and order. It is an affront to those already here legally, Coolidge knew, and would disqualify the lawbreaker from welcome assimilation, rewarding the lawless as if no consequences existed for defying our duly enacted standards. 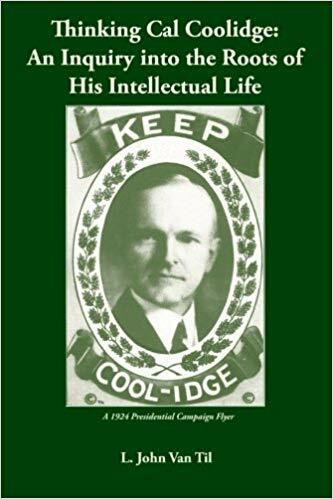 To Coolidge, America was not exclusively for the white, Anglo-Saxon, Protestant Republican, it was for everyone prepared to make the necessary sacrifices of full assimilation and meet the demanding expectations of self-governing citizenship in our constitutional Republic. 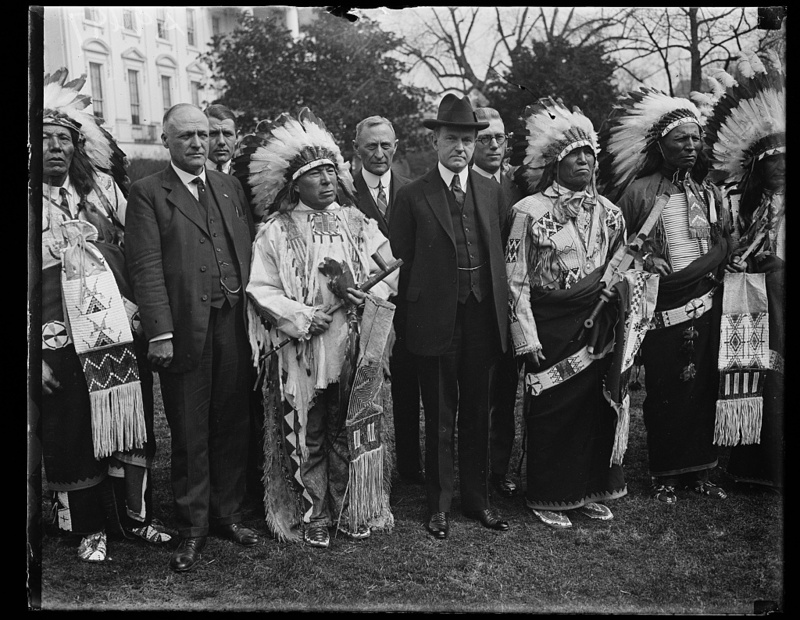 Granting a long-withheld citizenship to the American Indian tribes while also signing the Johnson-Reed Act that same year, restricting immigration, were not contradictory policies. They were achieving the same goal: to clear the way toward a complete assimilation, a maximization of opportunity, a people not focused on racial division and class hatreds but united and free. 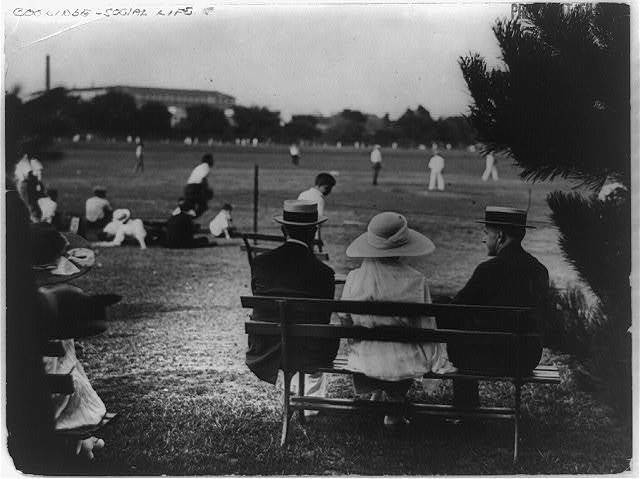 Freedom, Coolidge knew, requires responsibility and self-control if we are live together prosperously and peaceably. 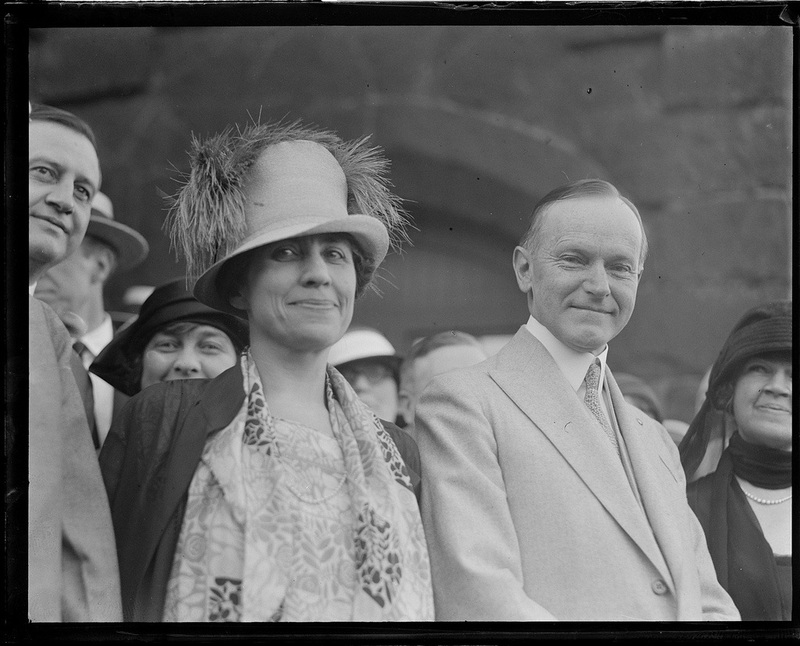 It was not an economic argument based in mere costs and liabilities that motivated Coolidge but it was, as he made plain in his Inaugural Address on March 4, 1925, a deep and equitable compassion for everyone, “not because I wish to save money, but because I wish to save people.” On the contrary, it is a cruel and selfish act perpetrated against people whenever an illegal alien crosses one of our borders. Each time carries additional burdens, not merely in financial terms, to someone already here lawfully. The alien cares not for these “faceless” obstacles, wanting only the “goodies” with none of the sacrifices it takes to be a self-governing American. Race-baiting and social division are harmful, fruitless distractions from the actual crime being inflicted on innocent people every day in this country by illegal immigration and its attendant consequences. 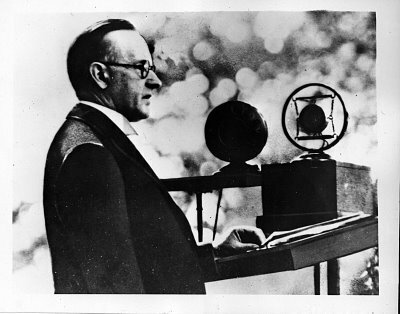 For Coolidge, standards of right and wrong matter for nations just as they do for individuals. When a nation forsakes the fair and equitable enforcement of its laws in order to please a demographic living in defiance of those standards, it is neither just nor compassionate. In Coolidge’s case, the argument which carried supreme weight was the one that considered the real good of everyone concerned, be they citizen, immigrant or alien. It is a resilient love for people that expects much rather than coddles them, instilling a sense of duty not a sense of entitlement. Coolidge understood that genuine compassion is only possible through an incremental process of assimilation into American life. Compassion is not found by suddenly creating a fixed “class” of dispirited dependents, evaporating the opportunities available to those here. Compassion is found by inspiring people to higher ideals, regardless of color or creed, to become self-sufficient, law-abiding individuals and free, honest Americans.